Instant Pot Thai Green Curry is a creamy coconut curry with the flavors of green chilies, Thai Basil, lime, coriander, and cumin. This spicy curry will rival your favorite Thai takeout green curry, but is so quick and easy that it can be ready in less than 30 minutes. Serve it with Instant Pot Jasmine Rice for an amazing flavor combination! This is the third Thai curry for the Instant Pot, that I’ve posted on the blog. My family loves Thai food and we used to go out to Thai restaurants all the time, but now we hardly ever do. I’m usually my own worst critic, and for me to say this is not easy: I think the Thai curries that I make at home are as good as restaurant Thai curries. Best of all, they are so quick and easy that I can have dinner on the table in 20 minutes if I prep the ingredients ahead of time and cook the Jasmine rice while I cook the curry, using the pot-in-pot method. I’d hate to repeat myself about my quest to create delicious, authentic Thai food, so please read my Instant Pot Thai Red Curry with Chicken post to find out how I came to perfect my Thai curry recipe. Bottom line is that ingredients make a big difference. I normally like to use Thai eggplant in my Instant Pot Thai green curry but I visited the Asian store three times in the past week and they were all out! So I made the curry with zucchini and bell peppers. I tend to use green vegetables just for aesthetics (!) so you can substitute any vegetables of your choice. There are four coconut curries that are most frequently found on Thai restaurant menus. 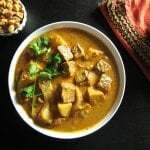 I’ve also posted recipes for Instant Pot Thai Red Curry, Instant Pot Thai Massaman Curry, and Instant Pot Thai Panang Curry. Thai green curry paste has a wonderful combination of flavors including green chilies, garlic, galangal ginger, shallots, lemongrass, lime leaves, coriander, cumin, cardamom, turmeric, and black pepper. Out of all the curries, massaman curry is the mildest and green curry is the hottest/spiciest. Even at Thai restaurants, I get the other curries medium or spicy, but I like to order mild green curry because it’s still pretty spicy! Serve this Instant Pot Thai Green Chicken Curry with Fragrant Instant Pot Jasmine Rice. The combination is so good, you’re going to want to lick your bowl! Maesri and Mae Ploy are my two favorite Thai curry paste brands. Lime leaves (also known as k-lime, makrut or kaffir lime leaves) and Thai Basil are also important ingredients in this dish. Try and find them if you can, because they add a ton of flavor. For the fish sauce, I use Red Boat brand. It’s more pricey, but very good quality. There’s no substitute for fish sauce. It adds that depth of flavor, the umami, to the curry. But if you’re vegetarian, I’ve had readers recommend the Fysh brand of sauce. I have not tried it. You may need to add a little extra. Palm sugar is more authentic to a Thai curry than brown sugar is. However, I frequently use brown sugar without sacrificing taste. I frequently get questions about the coconut milk curdling after being pressure cooked in the Instant Pot. Yes, it will appear to be curdled when you open the Instant Pot. But once you stir it up and cook the vegetables in the curry sauce, the curry should be very smooth. It’s important to buy a good quality coconut milk. I have had less-than-perfect Thai curry when I’ve used lower quality brands and/or light coconut milk. My two favorite brands are Aroy-D and Chaokoh. You can easily substitute other meats or tofu for the chicken, but you’ll have to adjust the cooking time – here are some approximate times. Note: the timing for meat is for bite-size strips! This recipe makes a green curry that’s fairly spicy, but not extreme. If you’re unsure, start with just 1 1/2 to 2 tablespoons of the green curry paste, and next time you can adjust the heat. I sometimes choose to decrease the quantity of chicken and double the quantity of vegetables, so we eat less meat and more veggies. If you’re new to the Instant Pot and aren’t familiar with how to use it, please read the Instant Pot DUO Beginner’s Quick Start Guide or the Instant Pot ULTRA Beginner’s Quick Start Guide first and then come back here to learn how to make Instant Pot Thai Green Curry with Chicken. Stir in coriander and cumin and cook for 30 seconds. Stir in chicken, remaining coconut milk, and chicken broth or water. Stir in fish sauce, brown sugar, lime juice, bell pepper, zucchini, onion, bamboo shoots, and lime leaves. Serve Instant Pot Thai Green Curry with Instant Pot Jasmine Rice. Instant Pot Thai Green Curry is a creamy coconut curry with the flavors of green chilies, Thai Basil, lime, coriander, cumin. This spicy curry will rival your favorite Thai takeout green curry but is so easy that it can be ready in less than 20 minutes. Press ‘Saute’ and stir in Green curry paste and 1/2 can of coconut milk until mixture is bubbly, about a minute or two. Add in fish sauce, brown sugar, lime juice, bell pepper, zucchini, onions, bamboo shoots, and lime leaves. splatter screen if necessary, in the first step, to guard against coconut milk splatters. You can choose to substitute the vegetables with your choice e.g. green beans, Thai eggplant, peas. You can also increase the quantity of vegetables to suit your tastes. * Lime leaves are also referred to as k-lime, makrut or kaffir lime leaves. Yes, come on over, Diane! This looks awesome and I am gonna try it soon..Can I substitute chicken with tofu? What type of tofu should I use? Firm or extra firm? Any suggested brand? Hi Tanu, I would use extra firm tofu and drain completely with a weight on top. Cook as you would the chicken, but for about 3 minutes and proceed with the rest of the recipe. If you get a chance, let us know how it worked for you! We enjoyed this green curry just as we did the red curry. Thanks! When you generate your nutritional values do you also calculate a serving size? We’ve made your red curry and Massaman and both are incredibly delicious. Can’t wait to try this one. Hi Malin – I’m so glad you like the recipes. I use the website http://www.myfitnesspal.com to calculate the nutritional information. At the top of the recipe card, you’ll see the number of servings (e.g. “yield: 6”). The nutritional information is for 1/6 of the recipe. Hope that helps. This looks great! I would like to cook the rice at the same time as the curry, would that still be 4 minutes on manual, just using the PIP method? Hi Emma – thanks for your comment. 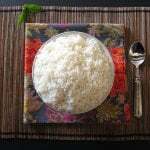 I pressure cook jasmine rice (in a separate dish on a trivet) and chicken for the 4 minutes – since Jasmine rice cooks in 4 minutes; then remove the rice and continue with the recipe. If you’re cooking a different kind of rice that takes 6 minutes or so, you might still be okay with chicken thighs and maybe cut them a bit bigger. Enjoy! We found some Thai eggplant in a local Asian market over the weekend and plan to try them in the green curry tonight. Does the cook time need to be adjusted? It feels like a rather dense vegetable. Thanks for the great recipes! Malin – they do take a bit longer to cook, but I don’t know if they might overcook if you add them with the chicken and pressure cook. I would cut them a little bigger if you’re going to cook with the chicken. You could do half and half: add some with the chicken and see how it does and the rest with other veggies and boil. That way you’ll know for next time. They discolor quickly, so cut them right before you’re adding them. Good luck! We tried this last night as you recommended with some Thai eggplant cooked under pressure and some added with the rest of the vegetables. The eggplant added at the end had a nice crunch to it and really took on the flavor of the curry. They were delicious. Unfortunately, the only evidence of the eggplant cooked under pressure were the seeds and the rolled up skins of the eggplant. I guess the pressure destroyed the meat of the eggplant which resulted in a much thinner sauce. Despite the thinner sauce the recipe was still awesome. For future recipes I think we will add the eggplant as soon as the chicken is done then add the remaining vegetables once the sauce comes to a simmer. Thanks for posting your curries! We’ve loved Thai food for years and love that we can now cook restaurant quality curry at home. We’ve had curry at least twice a week for the last month. Keep the Thai recipes coming! Oh! Good to know. I had a feeling it would be too much but wasn’t sure. Thanks for the update. I’m so glad you’re enjoying the curries. I love them too, especially because I can make them sooo quickly on a weekday. This came out really well even with one or two ingredients missing. I think, like most stews, it’s a fairly forgiving recipe. I’m so glad you tried it out and liked it! Thank you for commenting, Grumpy Old Man! This was great! I made it tonight and it tasted really authentic. I don’t eat chicken so I replaced the chicken with Tofu and threw the tofu in with the veggies and then did 4 mins of Manual mode. Hi Pallavi, thanks for your comment. Did the veggies overcook with the 4 min manual mode? I usually do the tofu for 4 min and then just use saute for the veggies. Glad you liked it. Hope you get to try out the other curries too! I have made this recipe and really enjoyed the flavors! How long would you cook if you doubled the recipe? Hi Chris – you can cook for the same amount of time as stated on the recipe. In general, for Instant Pot recipes, you don’t change cooking time if you change quantity. There are exceptions, for frozen food, thicker cuts of meat, etc. I love this recipe too! are the line leaves supposed to be removed before serving? Or do those just get dishes out and eaten too? Hi Selina, the lime leaves are a bit tough, so the only time I eat them is if I julienne them or cut them into tiny pieces (which I sometimes do to get a stronger flavor). You can just remove them either before serving, or set them aside when you encounter them. Made this tonight! It was sooo delicious but was too spicy for my family. Is there a way to make it less spicy? A little less curry paste? 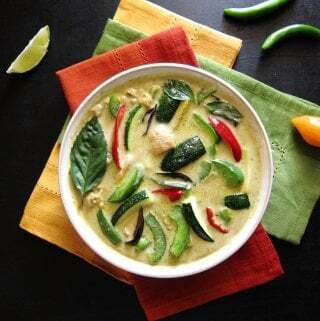 Natalia – green curry is actually the spiciest of the Thai curries. I would suggest adding less paste (say, 2 Tbsp) if you want the same quantity as the recipe. Alternatively, if you like gravy like I do, just add another half to whole can of coconut milk to mellow it out. If you like milder spice, try the Massaman curry – I just made it last week, very yummy. You can even use chicken instead of the beef. Thank you so much for your post. We just made this in our instant pot and it is fantastic. Hi Jay, thanks for letting me know! I’m really glad you liked it, it’s one of my favorites too – nice and spicy! Hi! I made this recipe and it was very good! I found it to be less sweet than I usually taste at the restaurant. I was wondering if I should add more sugar into the recipe to sweeten it up, or will that ruin it? Or, have you tried palm sugar in this recipe? Also, I found dried lime leaves to use the next time I make it, should I use the same amount of they are dried? Thank you! Hi Bree – thanks for your question! I always say you should eat what you like and change the recipe to suit your tastes. Some restaurants do serve Thai curries sweeter than others. I would add another one teaspoon of brown sugar, and then more after cooking and after tasting. Palm sugar is actually more authentic so that would work too. Yes, you can add the same quantity of dried leaves, and maybe a few more. Another option is to rehydrate them or crumble them to get more flavor. I have tried nearly a dozen thai curry recipes and just about gave up as none could come close to recreating the real deal, but this recipe is perfect. Comes out with rich flavor and consistency and doesn’t take much more than 45 minutes beginning to end. For next time I will up the lime and sugar and cut back on the fish sauce (just a tad too salty). Hi Bill – great to hear! I know what you mean; I had the same journey, even going so far as to create my own curry paste which ended up taking me about the whole day! I’m so happy to share with others, and thank you for taking the time to comment. This was delicious! I left my cumin at work so I substituted curry powder and it worked fine. I think the kaffir lime leaves makes all the difference in the world and I did 3 tbsp of fish sauce because it’s flavor is spectacular. Thanks for another great use for my pressure cooker!! Hi Cara – I’m really glad you like the curry! Thanks for commenting. I made this tonight and it is the best curry I have ever made at home. It’s one of the best curries I’ve ever tasted. This recipe is amazing. Thank you so much! Thanks so much, Kat! That’s a great compliment – you made my day! Hi there, just found your website and all the recipes look amazing. Planning to trial this one tomorrow… and whilst I’ve seen some recipes where they add the fish sauce, brown sugar, lime juice and even the lime leaves alongside with the chicken before it gets up to pressure, YOU add them after the chicken is cooked. Does it make a major difference? Many thanks and keep going, your work is amazing! Hi David – you could add it all in if you wanted to, but in my experience the flavors become mellow with pressure cooking – you could try it out both ways and see what you think. Thanks for visiting the site and for your kind words! You’re welcome – thank you for the great compliment! Hi there Merion, they may be referring to a whole boneless thigh, whereas this recipe uses bite-size pieces. Keep in mind that cooking time stated in recipes doesn’t usually need to change with larger quantities of a particular food, but will need to be changed with larger sizes e.g. A larger piece of meat, or a whole potato vs pieces. Hope that makes sense! We made this last night and it was wonderful. Any chance you have a yellow curry recipe? We’re big fans and can’t seem to make a good replica at home. It’s on my list of recipes to do! I’ve made a note of your request, will try and get it out! This recipe is a “WOW”! A longtime Instant Pot fan, I was skeptical the coconut milk would break under pressure; it didn’t! I followed your recipe exactly, it was perfect. I added these items first, about 1-2 minutes before I added the other vegetables – to which I added 2” pieces of haricots verts. This recipe is absolutely spectacular, a knockout – and like another contributor, I hope you/you’ve added a yellow curry. Thank you so much for what will be an Instant Pot dinner staple! Thank you, thank you for your kind words. And for sharing what changes you made. I’m so happy you enjoyed the recipe. So far I’ve made both this and your red curry and they have both been outstanding. I can’t wait to try the rest of your recipes. Thank you, Jessica! I’m so glad you like them – I think you’ll love the other Thai recipes too! I can’t wait to try your recipe…but need to know, do you live near sea level? I live at 8200 feet, so I am supposed to add 30% cooking time…which I definitely need to add (maybe even more than 30%) because so far all of the dried beans I have tried even adding the 30% have still not been soft enough…still too crunchy…so either my Instant Pot is not getting hot enough…or the altitude charts are off. It does cook steel cut oats perfectly adding the 30% (and usually I can’t cook steel cut oats at our altitude). Please let me know as I’d love to try your recipe asap! Suzanne, for this dish I don’t think you’ll need to adjust the recipe, but you can add 30% if you want to. I live at 5000 feet and most people can make my recipes with no changes. Made this today. My chicken thighs were over a pound so I upped the rest of the ingredients. Used Aroy-D coconut miilk. Used 2.5 Tbls Mae-Ploi green curry, nicely spicy for me. Found Japanese eggplant and used red pepper because I prefer it to green and it added nice color. Increased all vege by about 1/2. The lady at the local asian store recommended leaving the lime leaves out until the last couple of minutes and slicing them thin. I liked that tip. Since it’s just me, I only added enough Thai basil for one serving. Will take fresh basil for my left-overs. Thanks, Kelly, for telling us your modifications. That’s always nice for other readers. Yes, it’s a good idea to have some fresh basil to add to leftovers! Forgot to mention that I added 1/2? tsp cornstarch mixed with a bit of water to get that silky mouthfeel I find in my local Thai restaurant. I think that’s what I need to do. Mine came out a little watery for my tastes. Next time I want to try with Thai eggplant and make it a bit spicier. But all in all, this was great. Donna, just wanted to mention that the quality of the coconut milk is essential to the success of this recipe. If you used the brands I recommend, then you might need to thicken as you planned to but if not, I would suggest you try those brands. I’ve had less than optimal results with some other brands. Thanks for your comment! Thank you! I will make sure to try your recommendations. 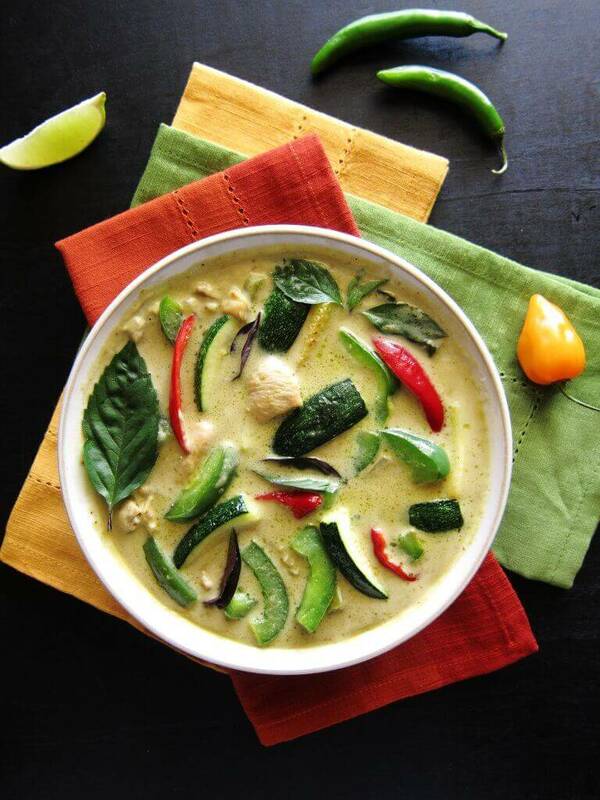 Green Curry Chicken is my absolute favorite dish when going out for Thai so nailing it at home would be awesome! My 29 yr old son came to stay with me this week and wanted my cooking, I told him pick ANYTHING! He wanted this dish from his favorite restaurant, I’ve never cooked Indian food before and he was beside himself. Thank you for making me look so good! It was amazing. 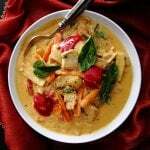 Hi Shauna – this is actually a Thai curry, so quite different flavors from an Indian curry. If you wanted to try an Indian flavored recipe, give the Instant Pot Chicken Curry Soup a try. Thanks for your lovely comment. Rachel, there are a couple of possibilities: your chicken may have given off liquid, your coconut milk may have been a thinner kind – buy the best quality (I recommend a couple of brands in the recipe). You might not need to have the 1/4 cup of liquid. I suggest the 1/4 cup water to prevent any issues with sealing the Instant Pot. I frequently omit it and have no problems with sealing. This is my new comfort food. We make the green, red, and panang curries all the time. Thank you Danielle, for your comment and review. I’m happy to see others enjoy my favorite recipes! 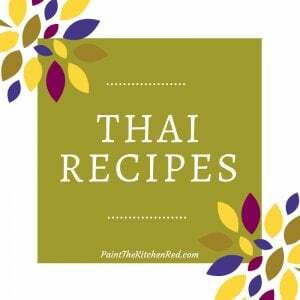 We love Thai and we are very excited to try this recipe, as I just got an Instant Pot for Christmas. I’ve tried many recipes and have gotten close, but not close enough, so I’m excited to try yours!!! We love extra sauce/gravy, how can I get the most amount of sauce without diluting the flavor? Thanks! Can’t wait!!!! Katherine, thanks for the comment – what a great compliment! I made this today it’s delicious and very flavorful but a bit bland what do you recommend to add a bit more authentic taste and a bit more spice? 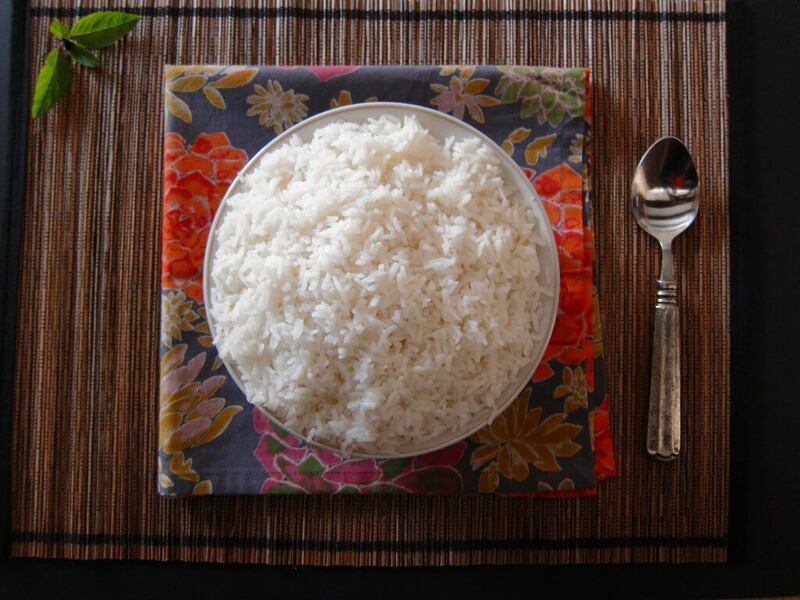 The jasmine rice turned out perfectly!!! Thanks for the great recipes… this was very easy to follow! I am trying to master Thai food and this is the closest I have gotten!! Anjali, did you use the brands of Thai curry paste that I recommend? If not, then that’s the reason for the lack of flavor. If you did, then you probably need to increase the quantity of curry paste by one to two more teaspoons. Thanks for your question! Unfortunately where I live I can only get those brands on amazon…. they messed up my Panang paste order I am waiting for them to send correct item! I used a different curry paste which explains it! 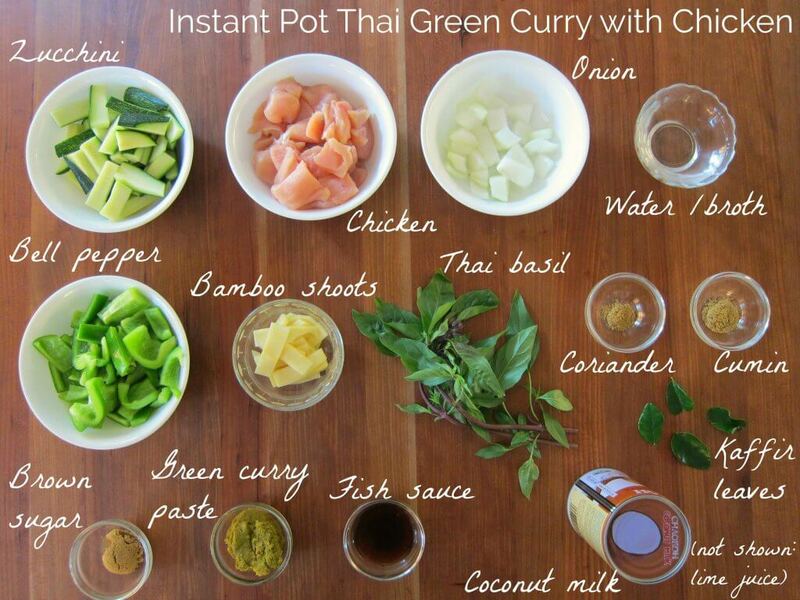 This is a fabulous recipe and so much simpler/faster than my regular green curry recipe. My son requested green curry for dinner, but I didn’t have the time to spend to make my regular recipe, so I found Neena’s. My family loved it and we didn’t have any leftovers, so I made it again 4 days later:). Just as delicious and easy the second time around. I put carrots, red pepper, (instead of green), bamboo shoots and pea pods the first time, and used eggplant the second. Flavor is great no matter what veggies you use. I borrowed the instant pot to make this. I had never used one. Neena’s directions were so easy to follow. You do a great job! Awww, thank you for your comment, Chris! It’s nice that you could compare to the traditional method – I too, love how easy Thai curries are in the IP. I’d like to make Thai hot and spicy soup (Tom Yum soup)-the kind without coconut milk. I feel like that could be an instapot soup—any ideas? Kathleen – yes, it can be made in the Instant Pot – you can pressure cook the aromatics (galangal, lemongrass, lime leaves) with the soup ingredients and get a flavorful broth. I have Thai soup on my list of recipes to post! Making this tonight, could I use lime zest instead of lime leaves? I can’t find the leaves anywhere. And could I use regular eggplant if I can’t find the Japanese? Or do you recommend using zucchini instead? Thanks! Molly – yes, you can substitute lime zest. I would add it after pressure cooking is complete and taste as you add a little at a time. Thai eggplant is very different from regular so it’s not a straight substitute. I would maybe do zucchini…. Hope you like the recipe. Thank you for your reply, I did use zest and both zucchini and a small amount of regular eggplant and OMG this knocked my socks off! Better than takeout! Can’t wait to try the rest of your recipes! I’ve made this and the red curry recipe and I learned something. If your coconut milk is all milk and no solids, prepare for a curdled mess. I had been using some store brand that was half solid and half water at room temperature, but I thought I’d try Chaokoh this time. It was all milky, no solids. When I let the pressure out, a lot of the curry came out of the release valve. When I opened the lid, it was pretty disgusting with curdled nastiness all over the inside of the lid. And the sauce looked gross but it tasted good. I had to add about a cup of chicken stock to have enough to cover the veggies. The end result was decent but I think it would have been better if I had used the store brand. How do I use the other cans of Chaokoh so I don’t get the same issue? Perhaps pressure cook at Low for a bit longer? Please help, and thanks! Monica – I use Aroy D usually but also use Chaokoh and although it does seem curdled when I open the lid, I just give it a good stir and it looks and tastes great. You should use the brand that you prefer if you like the results 🙂 Thanks for taking the time to comment and good luck! Thank you! It makes me feel better that it would also happen to you. If I see a can of coconut milk that doesn’t have any solids in it at all, should I not use it? I’m not sure if that’s where I went wrong. I’m still eating it but it definitely doesn’t look very good (it’s still delicious). I’m sorry, Monica but I’m not sure what happened. I would stick to the brand that worked for you before or you can give Aroy-D a try. If you continue to have issues then I would say you should try the low pressure method. I have seen a copycat brand that looks almost identical to Chaokoh and I’ve even used it and didn’t like it – is it possible you got that brand? It’s spelled slightly differently….